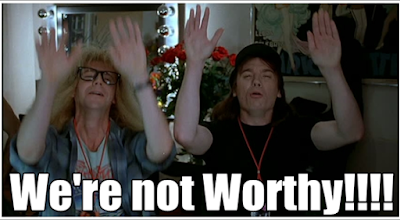 Today’s HIStalk newsletter included a short piece from one of their often anonymous contributors -‘Expanding Paunch’ - who called into question the ‘worthiness’ of those who’ll be ranked among the #HIT100. “Re: HIT100. I’d like to see the winners scored on real-life experience and accomplishments instead of chronic Twitterhea.” I spent way too much time thinking about this idea, coming up with a scoring methodology that reflects what I look for in assessing someone’s accomplishments in deciding whether they are therefore qualified to render healthcare-related opinions. Here’s my first pass – score yourself and your peers and tell me which criteria you would change. I’ll grade the HIT100 once they are named, using the self-reported information (often inflated) from their LinkedIn profiles since everything should be right there. The scores I tested tracked pretty closely to my assessments of some of our industry’s more prolific pundits, ranging from 0.5 points to over 70. I was kind in deleting an additional metric that deducted points for using self-styled, questionably accurate labels such as thought leader, visionary, thinker, innovator, and entrepreneur. Expanding Paunch shared an interesting commentary about being worthy of the #HIT100 ranking and his/her accompanying ‘spreadsheet rating’ chart offered some good metrics for supporting for her/his position. Education and work experience are key requirements for being a good source of "HIT" information, ideas and opinions. What does #HIT100 stand for? To be clear, “HIT” means “Health Information Technology.” I think most people who’ve been active in health IT and social media for any length of time understand that the #HIT100 event was borne based on the idea of acknowledging one’s healthcare IT knowledge, skills, experience AND social abilities relative to the creation, curation AND dissemination of insight, ideas, opinions and occasional facts regarding healthcare information technology products, services, challenges, opportunities and issues - via social channels. What Makes a ‘Good’ #HIT100 Nominee? For some reason, ‘Expanding Paunch’ doesn’t appreciate the value that a solid background in information technology, a 'non-clinical' background, experience with content creation and curation, and the ability to share content across a range of social channels can have. I've shared my take on What Makes a Good #HIT100 Nominee and 11 Qualities of a Good #HIT100 Nominee. Non-IT, Clinical Management Expertise Only? 1. Penalizes those who aren't a "provider of clinical care" and/or not having a direct patient clinical care focus. I get the fact that ultimately it's all about the patient and providing clinical services. But the reality is that administrative, financial, communication and other 'non-clinical services' provided by people other than physicians are important parts of healthcare. 2. Doesn't include any acknowledgement of a person's social footprint. What's an Ideal #HIT100 Nominee? 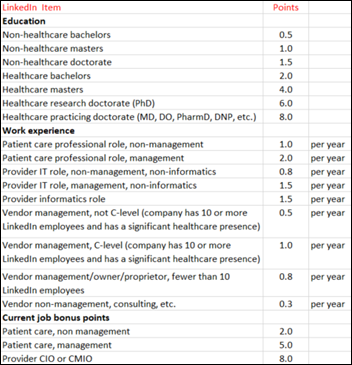 I guess a practicing physician who’s a CMIO at a vendor with some sort of 'informatics only' role is considered the ideal #HIT100 prospect? Regardless as to whether they actively share their knowledge via social channels, conferences, podcasts, etc. How Do You Rank on the Expanding Paunch Scale? I did a one minute calculation of my ‘#HIT100 worthiness’ based on the ‘Expanding Paunch' algorithm and I garnered about 20 points - apparently I’m not worthy. I'm looking forward to ‘Expanding Paunch’s’ rating of the HIT100 ‘winners.’ And I’d like to know more about how ‘Expanding Paunch’ ranks himself too. P.S. 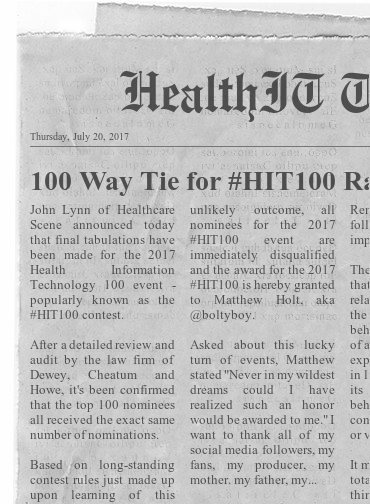 In the past, I spent a lot of time tabulating and sharing #HIT100 info and commentary when others wouldn’t or weren’t able to tabulate and/or share. This post is my contribution to this year's #HIT100 event. Invert the #HIT100 List! Help Turn Health IT Upside Down! What Makes a Good #HIT100 Nominee?